I’ll admit, another reason why I don’t post as often as I did is that I don’t have as much material to post any more. I haven’t written anything new, still waiting for Jasper City to come back from a beta (also seeking more betas, if you’re interested), and waiting for Swamp Gas to be rejected by another publisher. And then work is exhausting. There are only so many post I can devote solely to those problems before it gets boring. Perhaps it already has been boring. I’d like to change that. I’m going to take this opportunity to show off something new that I’m still excited about. It’s shameless, I’ll be the first to admit. But it is mine and I am happy with it. Those of you who have read Margaret Atwood’s The Handmaid’s Tale will recognize this line. For those who aren’t, it becomes awkward to explain what the tattoo means and how I came across the line. It isn’t proper Latin, and that’s the part that makes one’s eyebrow rise in disapproval and give me a “You know this is permanent, right?” look. But I don’t care. There are many tattoos like it but this is mine. 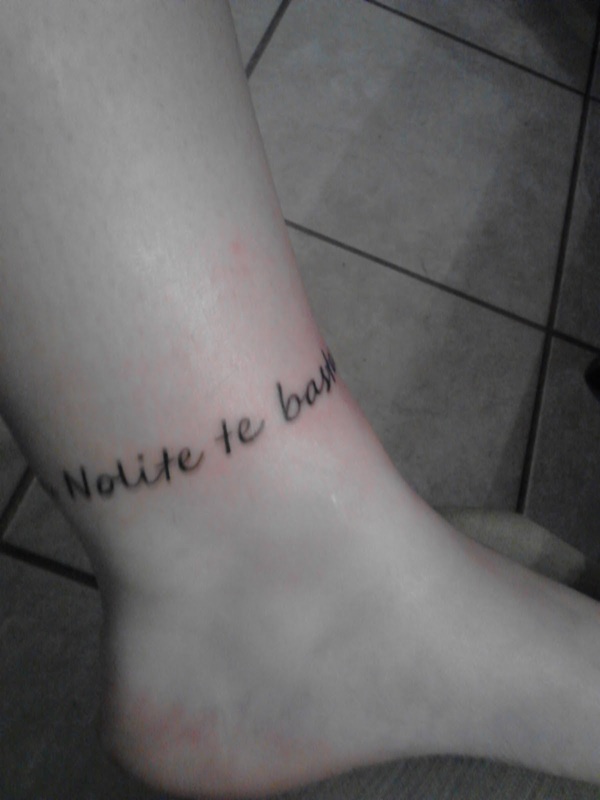 The camera in my phone is poor, but you can still see the redness around the tattoo. This was taken on Sunday, 5-5, less than an hour after it was completed. At the time of this writing the soreness is long gone and it has begun to itch. I’m using lots of lotion and avoiding the urge to scratch. This is going the first of many, including more references to books.